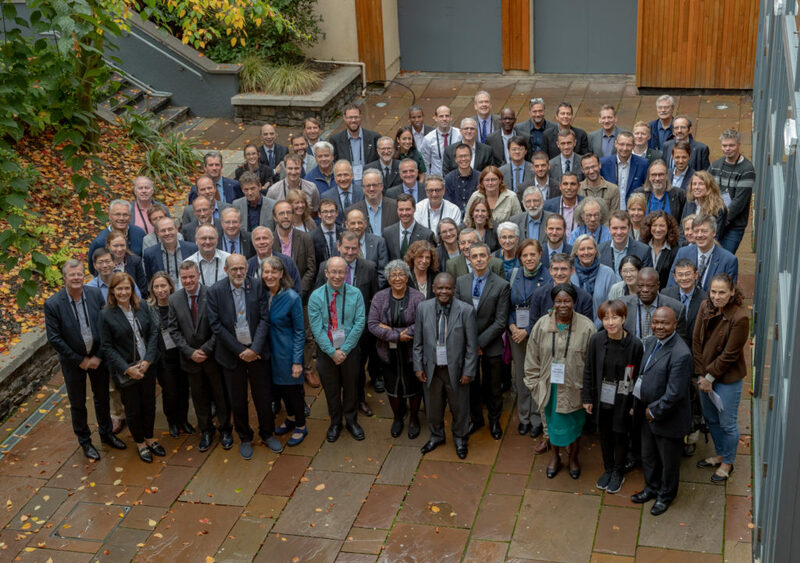 The National Biodiversity Data Centre was delighted to host the 25th meeting of the Governing Board of the Global Biodiversity Information Facility (GBIF) in Kilkenny from 15th to 18th October, 2018. The event saw delegates from 57 Participant Countries and 36 other Associate Participants across the world attend the Governing Board meeting. To coincide with the formal Governing Board meeting, there was a number of associated events around the theme of how biodiversity data are being used at a global, regional and national scale to inform policy and action on the ground for biodiversity. GBIF GB25: Node representatives from the across the global network of GBIF, Kilkenny, October 2018. Speaker biographies are presented below to accompany PDFs of Powerpoint slides which have been made available for each of the presentations. 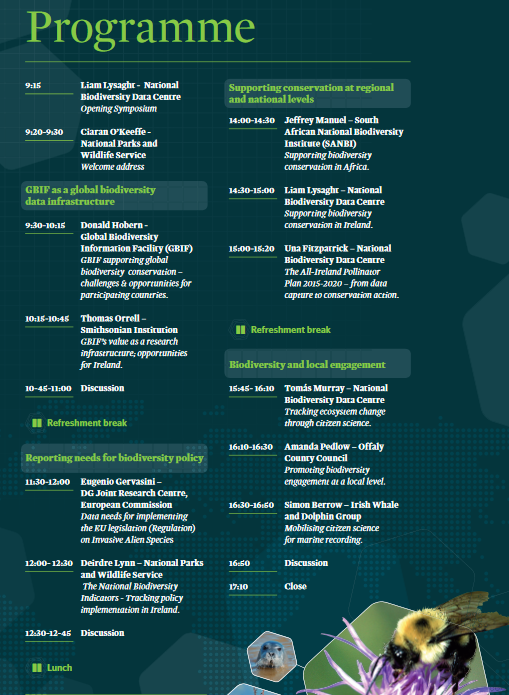 Download the full programme with speaker bios. On Thursday 18th October, the National Biodiversity Data Centre hosted a public symposium Biodiversity loss in a changing world: local data, global action which provided a unique opportunity to hear about some of GBIF’s work and its global network. A keynote address was delivered by Donald Hobern, Executive Secretary of GBIF, in addition to speakers talking about how data are used to inform biodiversity action at a regional and national level. Speakers from Ireland outlined a number of use cases where data is used to better inform policy and encourage greater local community engagement. Video recordings of each of the presentations will be made available in early December, but in the meantime, you are more than welcome to download a .pdf version of each presentation, courtesy of the speakers who delivered talks on the day. Ciarán O’Keeffe, National Parks and Wildlife Service: Welcome address. Ciaran is Principle Officer with National Parks and Wildlife Service of the Department of Culture, Heritage and Gaeltacht Affairs. Ciaran has responsibility for the science and biodiversity within NPWS. In addition to other roles, Ciaran is a member of the Management Board of the National Biodiversity Data Centre. Donald Hobern, Global Biodiversity Information Facility (GBIF): GBIF supporting biodiversity conservation – challenges for participating countries. Donald is the Executive Secretary of the Global Biodiversity Information Facility, headquartered in Copenhagen, Denmark. He is responsible for coordinating the activities of the global network for sharing biodiversity data including 54 countries and many international organisations. His career spans over thirty years in software development and biodiversity informatics. From 2007 to 2011, he worked for the Commonwealth Scientific and Industrial Research Organisation (CSIRO) as the inaugural Director of the Atlas of Living Australia. During the same period, he also spent three years as Chair of the Taxonomic Databases Working Group (TDWG), the international organisation responsible for development of standards for exchange of biodiversity data. Gregory Riccardi, Florida State University & iDigBio.org: GBIF’s value as a research infrastructure for Ireland. Greg who is co-director at one of GBIF’s non-state participants, iDigBio, enjoyed a longstanding career as a professor in Florida State University’s iSchool for 37 years and taught across many subjects including Computer Science and information Technology. Gregory holds a position as Director of Morphbank which is a database of images that scientists use for international collaboration, research and education and is also co-director of Intergrated Digitized Biocollections (iDigBio) which is an initiative that aims to digitize and make available biological specimen data across the United States.Greg and iDigBio’s efforts make information about biological and paleontological specimens in U.S. research collections freely open and available online, improving research and outreach to scientists, researchers, students, educators and other user communities for the benefit of all sectors of society. Eugenio Gervasini, DG Joint Research Centre, European Commission: Data needs for implementing the EU legislation (Regulation) on Invasive Alien Species. Eugenio graduated in Agricultural Sciences at Milan University, and specialized in entomology, phytopathology, Integrated Pest Management and biological control of pests. He worked 15 years at the Lombardy Plant Protection Service (Northern Italy), where he was in charge of the diagnostic labs. In 2003, he joined the Food and Veterinary Office (FVO) Directorate of DG SANTE in Grange (Ireland), where he carried out audits on national plant health control systems, and coordinated dossiers concerning Member States’ national surveys for agriculture, forest and environment quarantine organisms. He joined the JRC European Alien Species Information Network (EASIN) Team in December 2014, where he is in charge of coordinating the Editorial Board, Citizen Science activities and communication. Deirdre Lynn, National Parks and Wildlife Service: The National Biodiversity Indicators – Tracking policy implementation in Ireland. Deirdre works in the Scientific Unit of the National Parks & Wildlife Service. Her remit includes Biodiversity monitoring and reporting at the national, EU and global level. She is also involved in policy formulation and review such as the National Biodiversity Action Plan and the Biodiversity Sectoral Plan for Climate Change Adaptation and the Sustainable Development Goals. She forms part of the Irish delegation for the Expert Reporting Group under the EU Nature Directives and the UN Convention on Biological Diversity and its Scientific Subsidiary body. Jeffrey Manuel, South African National Biodiversity Institute (SANBI): Supporting biodiversity conservation in Africa. Jeffrey is the Director of Biodiversity Information and Planning at the South African National Biodiversity Institute. His primary expertise lies in spatial analysis & prioritisation supporting the mainstreaming of biodiversity science and information into environmental management and policy. Liam Lysaght, National Biodiversity Data Centre: Supporting biodiversity conservation in Ireland. Liam is Director of the National Biodiversity Data Centre, and heads up a small team based in Waterford. The Data Centre is responsible for collation, management and dissemination of data and information on Ireland’s biological diversity and operates some monitoring programmes to track change. He also serves as Head of Delegation for Ireland to the Global Biodiversity Information Facility (GBIF) and is 1st Vice-Chair of GBIF’s Budget Committee. He is a very experienced conservationist having worked in the nature conservation sector for 30 years. Previously he was employed as Wildlife Officer with the Heritage Council, an independent statutory advisory council, and earlier as a Park Ranger in two of Ireland’s National Parks. Úna Fitzpatrick, National Biodiversity Data Centre: The All-Ireland Pollinator Plan 2015-2020 – from data capture to conservation action. Tomás Murray, National Biodiversity Data Centre: Tracking ecosystem change through citizen science. Tomás has 15 years of research experience on insects investigating how their ecology, diseases and genetics impact their survival. He now works for the National Biodiversity Data Centre co-ordinating national citizen science monitoring schemes for insects and development of National Biodiversity Indicators. Amanda Pedlow, Offaly County Council: Promoting biodiversity through citizen science. Amanda is the Heritage Officer with Offaly County Council in the midlands of Ireland. Her role is to implement the Offaly Heritage Plan 2017-21 in partnership with Council staff, many agencies and communities. The brief is broad covering archaeology, architecture, geology, heritage objects, inland waterways in addition to wildlife and landscapes. One objective of this plan is to promote citizen science biological recording, availing of the services provided by the National Biodiversity Data Centre. Simon Berrow, Irish Whale and Dolphin Group: Mobilizing citizen science for marine recording. Simon has been working on cetaceans in Ireland since 1987. He is founder member, and current Chief Science Officer, of the Irish Whale and Dolphin Group which was established to co-ordinate long term recording schemes by empowering the potential of citizen science. The data from these schemes support the development of conservation policies and best practice guidelines for the conservation and management of cetaceans in Ireland. Simon is also a lecturer in the Galway-Mayo Institute of Technology contributing to the Applied Freshwater and Marine Biology degree and Masters programmes. He has over 100 scientific papers in peer-reviewed journals to his name and sits on a number of scientific committees. GBIF acts as a respository for biological data collected from all over the globe, providing an evidence base for key research and conservation policies around the world.